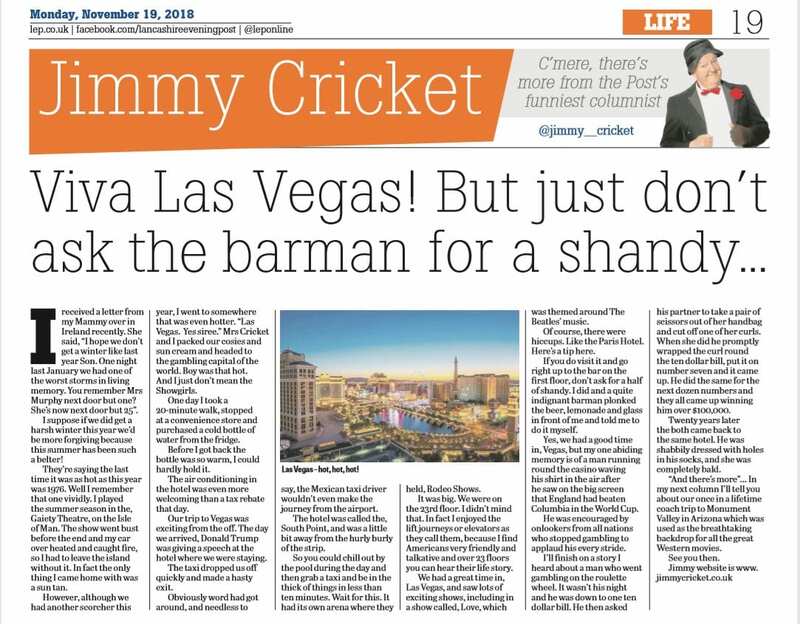 Jimmy Cricket reflects on his holiday in the United States earlier this year in his latest newspaper column – and suggests not asking for a shandy in Las Vegas! The famous comedian went with his wife May in the summer to Vegas, a resort city known for its vibrant nightlife, centered around 24-hour casinos and other forms of entertainment. And in his November column in the Lancashire Evening Post, he talks about the hot weather and asking for drinks at the bar. He says: “I suppose if we did get a harsh winter this year we’d be more forgiving because this summer has been such a belter. “However, although we had another scorcher this year, I went to somewhere that was even hotter. ‘Las Vegas. Yes siree.’ Mrs Cricket and I packed our cosies and sun cream and headed to the gambling capital of the world. “Boy was that hot. And I just don’t mean the Showgirls. One day I took a 20-minute walk, stopped at a convenience store and purchased a cold bottle of water from the fridge. Before I got back the bottle was so warm, I could hardly hold it. The air conditioning in the hotel was even more welcoming than a tax rebate that day. “We had a great time in, Las Vegas, and saw lots of exciting shows, including in a show called, Love, which was themed around The Beatles’ music.